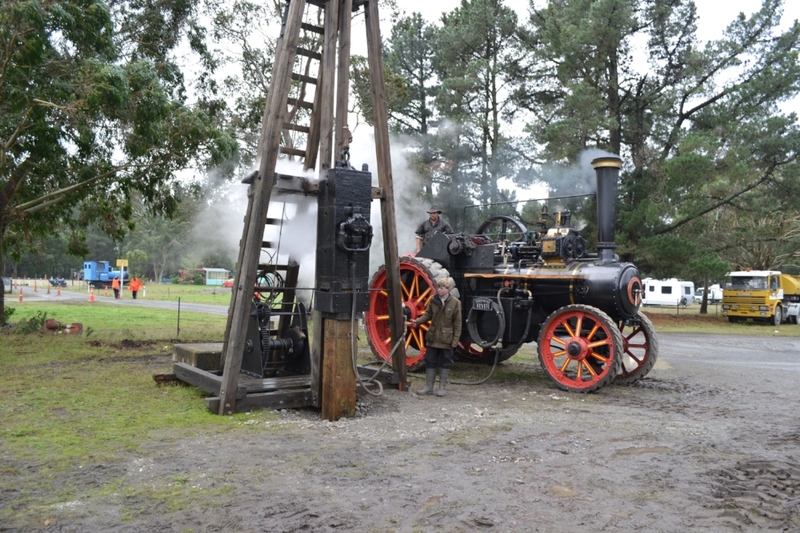 Stage 1 was the development of the land so that traction engine and steam rallies could be held with the minimum of organisation and preparation beforehand. To this end a ring area was fenced off together with a car park, a 4” well sunk to the 50ft strata and a pumphouse and tankstand erected. Underground water reticulation was installed, a barbecue area developed, toilet block constructed, and a program of tree and shrub planting commenced to provide for additional shelter and beautification. Since this stage was completed regular rallies have been held. 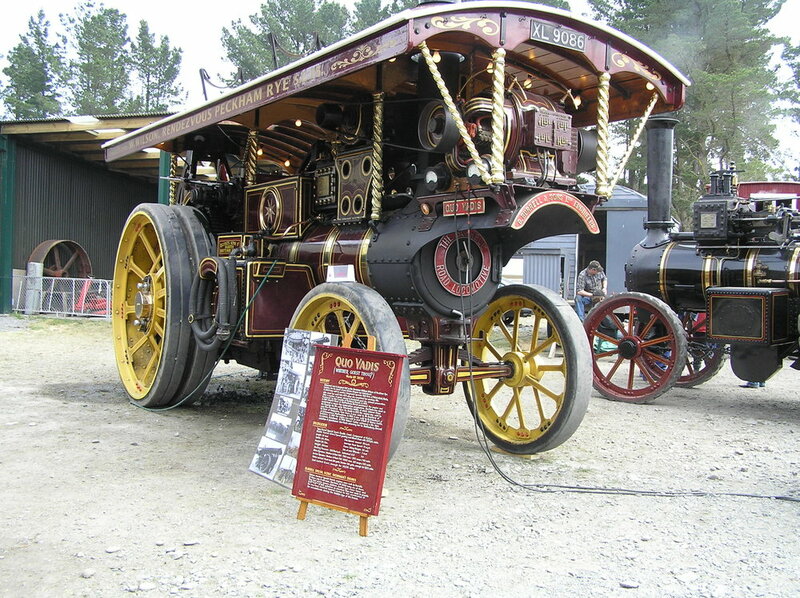 Quite a number of our members are owners of traction engines and steam road rollers and on rally days up to 20 engines restored to first class condition have been seen on the grounds. Stage 2 is the construction and operation of the bush tramway, which we hope you have ridden on today. We are endeavoring to set up a bush tramway as they were on the west coast of the South Island and in other parts of the country. You may ask “What is a bush tramway?” Unlike the electric street tramways which used to be part of our city transport systems the bush tramway was actually a light railway laid into native forest to transport logs from the forests to the sawmill which was often some miles away. The reason for not calling them light railways was that the legal requirements for a tramway are less, one of the few limitations being that they could not operate after sunset. From wooden rails and horse and mule motive power the bush tramways progressed to iron and steel rails and small steam locomotives, this combination allowing heavier loads to be hauled on the steep grades and sharp curves. Tunneling was avoided wherever possible as the track was usually uplifted after the area it had served was cut out. About the turn of the century there appeared on North American logging railroads steam locomotives especially built for the work required of them. These were the geared logging locomotives of various makes but all employing some form of reduction in the main drive between the cylinders and driving wheels, either through bevel gearing or chains and sprockets to give plenty of power at low speeds. Which was essential to move the heavy loads on the tramways. 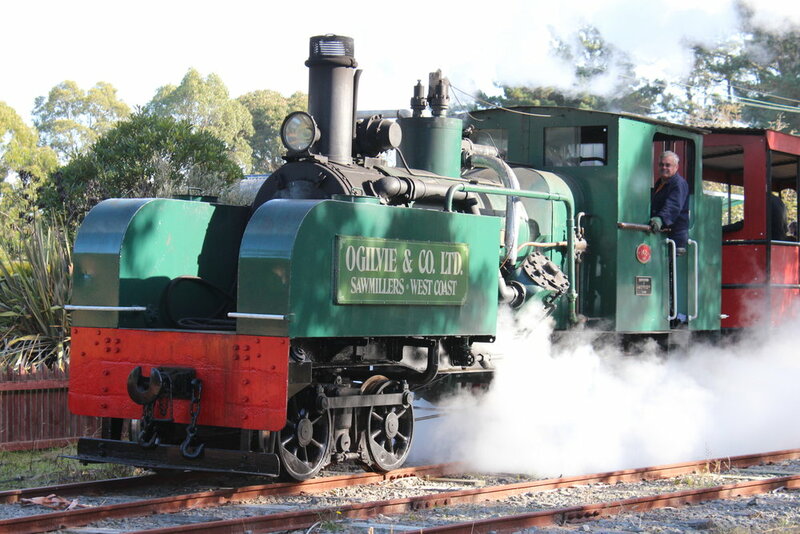 The locomotive in use on our tramway is an example of a home grown geared logging loco. Built in 1943 by A & G Price of Thames in the North Island to the order of Ogilvie & Co., Gladstone, Westland it ran on their extensive bush tramway until 1958. Approximately 3,500 man hours have been spent on its restoration over a 4 year period. Weight of the loco is 20 tons and the ‘V' type engine has cylinders 10” diameter by 9” stroke and the valve gear actuates piston valves. Boiler pressure is 150 psi and approximately 1 ton of coal is carried in the bunker and 450 gallons of water in the side tanks. Stage 3 is the next job that was undertaken and is the building of a steam museum to house operating steam engines and boilers. The great Industrial Revolution of the last century would not have been possible without the stationary steam engine. Steam Train & Museum OPEN and in Steam on the 1st Sunday of every month during the year, "except during fire ban periods" 10am until 3pm. The Steam Train Operates on both the 1st & 3rd Sunday. During fire bans the Historic Rail Car usually runs instead. Canterbury Vintage Car Club Swap Meet - Steam train running on each day. Steam Extravaganza will be held during the second weekend in April - Not to be missed by Steam Enthusiasts! Dates will be advertised early. If you have any questions or comments, complete the form below to send us a message. Apply here for a “Membership Form”. Also apply here for a digital copy of the latest newsletter. Copyright © 2017 Canterbury Steam Preservation Society.